After logging into Hootsuite, a small notification box popped up, letting me know that Hootsuite now has a new "tool", if you will. Hootsuite is making it easy for you to post directly to the account without having to switch back and forth between the login of Hootsuite and copy and pasting the URL into the posting dashboard. How convenient?! But then I started to think a little, I thought I had seen something about Hootlet coming out last summer. Slightly confused I started to browse around Hootsuite's website and blog, looking for the posts that explained what Hootlet was released. I found one blog post from them, explaining the Autoschedule feature....seems to have a lot of improvement since 2009. But why the big push now? What prompted the pop up today when I logged into Hootsuite? Hootlet becomes a small icon in your browser bar, a Bookmarklet, and you have the ability to post the current page you are on to any social media account you have listed in your Hootsuite account. I was aware of Hootlet's presence with Hootsuite last summer but did not think much of it and the features it provided. But suddenly Hootsuite was telling me about Hootlet today and gave me a pop up - why now? Could Hootsuite tell that I haven't added their Bookmarklet to my browser bar in over a year and they wanted me to join in? 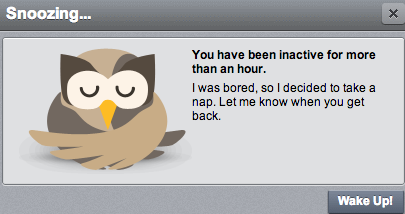 Oops, sorry Hootsuite. Now that I have added Hootlet to my browser bar, let's see what you can do! With the new Chrome extension, Hootlet now allows easier access to Facebook, Twitter and LinkedIn. Have you tried Hootlet? What do you think of it?